Discover more about our Raleigh location, plan a visit, view specialty dining menus, and more. 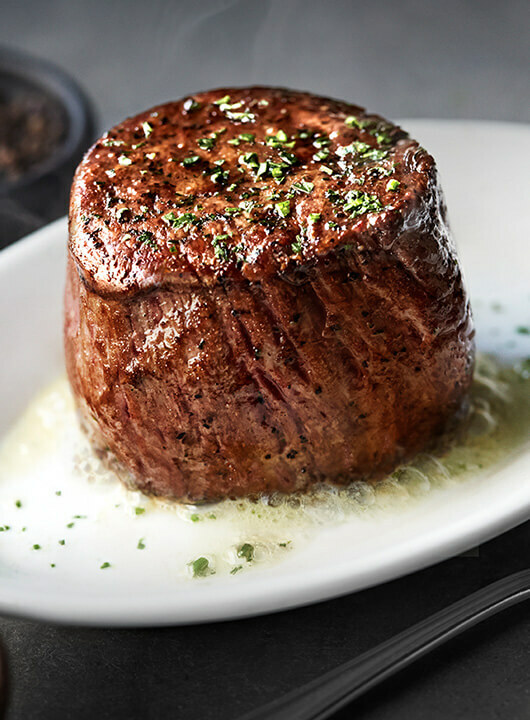 At Ruth's Chris, your last bite is just as good as your first. Our perfected broiling method and seasoning techniques ensure each cut of USDA Prime beef we serve arrives cooked to perfection and sizzling on a 500° plate—just the way Ruth liked it. Tender filet and hearty New York Strip combined into one 24-ounce USDA Prime cut. 40 ounces of prime beef with the rich flavor of a strip and the tenderness of a filet. Three chops cut extra thick that are marinated overnight and broiled to perfection. 11 ounces of our most tender cut of lean, midwestern beef. A 16-ounce full-flavored USDA Prime cut, with a slightly firmer texture than a ribeye. A smaller 8-ounce cut, but equally tender and delicious. 40-ounces of USDA Prime bone-in Ribeye broiled to perfection and hand-cut tableside. A 16-ounce cut with a blend of marbling and mellowness near the bone. 22 ounces of perfectly marbled and generously flavored bone-in cut. Six additional large shrimp dusted with blackening seasoning and broiled. Fresh, creamy bleu cheese, roasted garlic and a touch of panko bread crumbs. If there’s one thing to know about steaks, it’s that USDA Prime is the best of the best. Representing the top 2-3% of cattle, these cuts are well marbled and hand-selected for thickness and tenderness. Ruth only served her guests the finest—and that’s why we serve custom-aged USDA Prime beef. We know a thing or two about the perfect steak, but it's not all we hang our hats on. Whether you're in the mood for chicken, fish or lighter vegetarian fare, we've got something to please every palate. A generous serving of pan-roasted Chilean Sea Bass served over sweet potato and pineapple hash and topped with citrus coconut butter. Double-breasted chicken that's been oven roasted, stuffed with garlic herb cheese and topped with lemon butter. A selection of hearty vegetarian options that vary by location. Ask your server for details. Start your Ruth's Chris experience off right with mouth-watering, internationally inspired appetizers and delectable sides. These dishes are prepared to order with fresh, high-quality ingredients, and guaranteed to complement any entrée. Lightly fried and tossed with a sweet and spicy Asian chili sauce. Colossal blue crab peaks atop a mild medley of avocado and mango, combining sweet and savory flavor in every bite. Maine lobster, king crab legs and knuckles, colossal lump crab meat and jumbo cocktail shrimp served with both Sriracha-lime seafood sauce and cocktail sauce. Sautéed New Orleans style in wine, butter, garlic and spices. Saffron-infused pasta filled with veal osso buco and fresh mozzarella cheese and topped with a white wine demi-glace. Roasted with honey butter to a warm caramel color and tossed with crispy bits of bacon. Generous portion of tender lobster combined with our signature three-cheese macaroni. Roasted corn sautéed in butter and topped with salsa verde. Roasted mushrooms seasoned with fresh thyme and garlic. Whipped sweet potatoes topped with a savory pecan crust. Grilled until tender and served with our house-made buttery hollandaise sauce. Chopped spinach in a New Orleans style cream sauce. A Ruth's Chris classic. A one-pound potato fully loaded with all of your favorite fixings. Idaho sliced potatoes topped with a savory three-cheese sauce. Creamy mashed potatoes with a hint of roasted garlic. Cut extra thin and served extra crispy. Our fresh soups and salads are a great start to a perfect evening at Ruth's Chris. All of our dressings and soups are made fresh in-house, using exclusive recipes. A delightful blend of locally sourced Heirloom tomatoes served with fresh mozzarella and topped with fresh basil, an aged balsamic glaze, and extra virgin olive oil. A Ruth's Chris original. Julienne iceberg lettuce, baby spinach and radicchio are paired with red onions, mushrooms, green olives, bacon, eggs, hearts of palm, croutons, bleu cheese dressed in a lemon basil dressing and topped with crispy onions. A crisp wedge of iceberg lettuce atop field greens, topped with bacon, bleu cheese and your choice of dressing. A classically prepared warm and creamy bisque topped with a sprinkling of freshly chopped parsley. Mixed greens topped with roasted corn, dried cherries, crispy bacon, tomatoes, goat cheese and cajun pecans, tossed in a white balsamic vinaigrette. At Ruth’s Chris, there’s more to our bar than world-class wines. We specialize in handcrafted cocktails, from vintage classics to our very own house specialties... and your own personal favorites, too. All made with fresh-squeezed juices, premium spirits and the perfect finishing touches. *Items are served raw, or undercooked, or may contain raw or undercooked ingredients. Consuming raw or undercooked meats, poultry, seafood, shellfish or eggs may increase your risk of food-borne illness.